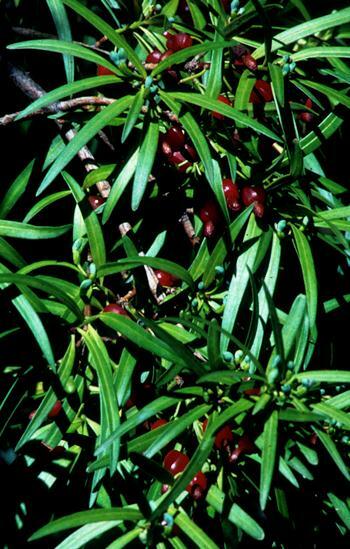 Podocarpus salignus is endemic to central and southern Chile where there has been reduction of its habitat due to landuse change. Dioecous tree up to 20m tall. Canopy pyramidal and more or less rounded. Trunk up to 1m in diameter. Bark has thin plates in older specimens, greyish. 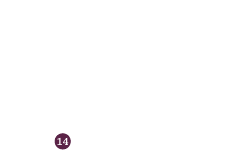 Leaves 5–10 x 0.6–0.7cm, linear-lanceolate, slightly falcate, simple, alternate, pendulous, pointed at the apex. Male pollen-cones 2.2–5cm, solitary or grouped, sessile. Female seed-cones, solitary, axillary, peduncle 1–1.5cm long; flowering between december and january. 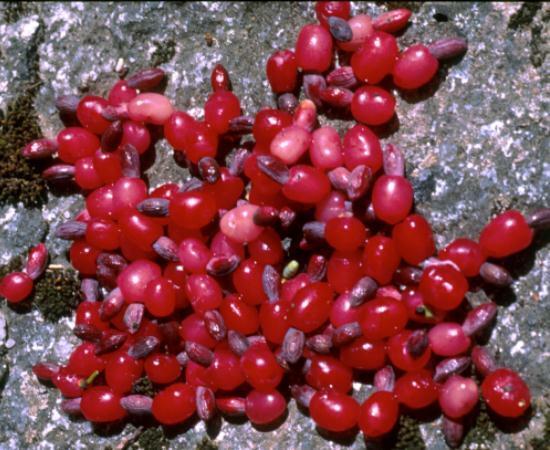 Seeds 1–2, 7–8 x 4mm, red and subtended by a fleshy, violet-red aril; fruits maturing from January to May. Endemic to Chile where it occurs in the Andes and the Coastal Cordillera. Its distribution includes the following geopolitical units: Región VII -Maule: (Prov. de Cauquenes, Prov. de Linares, Prov. de Talca); Región VIII - Biobío: (Prov. de Arauco, Prov. de Biobío, Prov. de Concepción, Prov. de Ñuble); Región IX - Araucanía: (Prov. de Cautín , Prov. de Malleco); Región X - Los Lagos: (Prov. Osorno, Prov. de Valdivia). Although the extent of occurrence exceeds 20,000km², subpopulations are scattered unevenly and this species is very rare in the northern part of its range. The area of occupancy is uncertain and very few localities have old growth trees. In the Mediterranean region it grows in the Roble-Hualo forest type (coastal Maulino forest) and often close to watercourses. Here it is associated with Nothofagus dombeyi, N. obliqua, N. nervosa, Peumus boldus, Persea lingue, Drimys winteri, Aextoxicon punctatum, Gevuina avellana, Myrceugenia exsucca and Laruelia sempervirens (Donoso, 2006). In the same region in the Andes Cordillera it can form pure stands above 1,100m altitude in wet areas that are not necessarily associated with watercourses: this specific habitat is known as mañihuales. It can also be found at lower elevations in the same region associated with other species in ravines on south-facing aspects. Its overall altitudinal range is from 10 to 1200m. In the Mediterranean region it often grows on soils derived from andesite but in the south of its distribution it occurs on soils derived from mica schist. It forms a dioecious tree to 20m tall which becomes sexually mature between 10–20 years (Donoso, 2006). Although most of the seed matures from February through to early April, a proportion of seed can mature and be disseminated by birds throughout the year (Donoso, 2006). This species has not been widely utilized for its timber (Donoso, 2006). The foliage is commonly used in the cut flower industry in Chile and the species is often grown in temperate countries as an ornamental tree. In Britain and Ireland there are some notable specimen trees from the original introduction from Chile during the mid 19th century and in some of these sites there is abundant regeneration. According to recent surveys including targeted fieldwork (CONAF et al.1999, Hechenleitner et al., 2005) there has been at least a 30% decrease in the population over the last three generations (60 years) following the conversion of native forests to commercial plantations and the devastating effects of fires. On this basis Podocarpus salignus has been assessed Vulnerable. 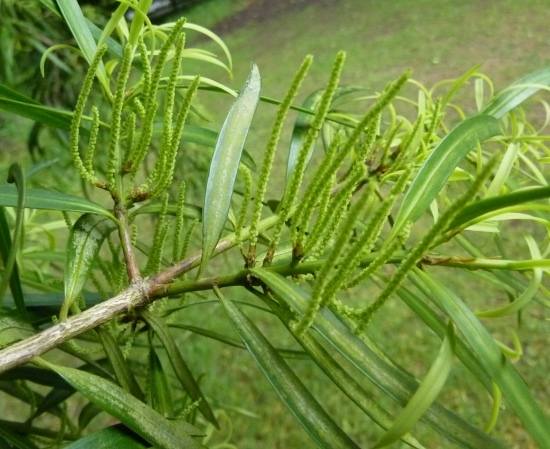 The population of Podocarpus salignus has been reduced, particularly in the northern part of its range, through the conversion of its habitat to commercial forestry plantations of Pinus radiata and Eucalyptus spp. and through the effects of fire. The coastal habitats, where it was once quite abundant, have been dramatically reduced in recent years through the change of landuse: in most areas there are no suitable habitats left for this species. It is likely that there will be a progressive decline in the species due to the continuing degradation of its habitat. Few intact habitats have been recorded. There are very few locations or subpopulations within protected areas. It is only afforded protection in two locations in the Coastal Cordillera (where it is most threatened) within Reserve Nacional Los Ruiles (Región VII) and Parque Oncol (Región X) and one location in the Andes in Reserva Forestal Malleco (Región IX). There are significant, well documented, ex-situ collections in Britain and Ireland that have research and conservation value. Allnutt, T. R., Courtis, J. R., Gardner, M. F. & Newton, A .C. (2001). 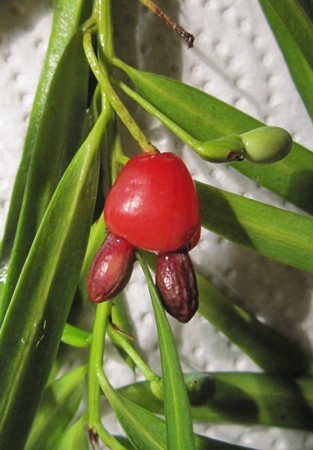 Genetic Variation in Wild Chilean and Cultivated British Populations of Podocarpus salignus D. Don (PODOCARPACEAE). Edinburgh Journal of Botany 58(3): 459-473. CONAF, CONAMA, BIRF, Universidad Austral de Chile, Pontificia Universidad Católica de Chile and Universidad Católica de Temuco. (1999). Catastro y evaluatión de los Recursos Vegetacionales Nativos de Chile. Informe Nacional con Variables Ambientales. Santiago, Chile. Concha, M.C. (1995). Rol de los claros en la regeneración natural de Podocarpus saligna, en un bosque valdiviano (San Martín). Facultad de Ciencias, Universidad Austral de Chile. Donoso, Z.C. (ed.). (2006). 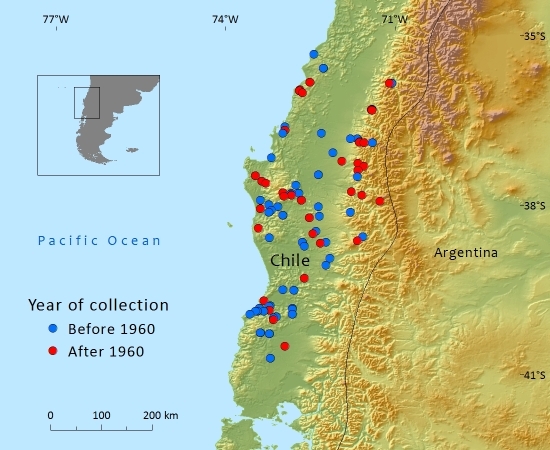 Las especies arbóreas de los bosques templados de Chile y Argentina. Autoecología. pp. 678. Marisia Cuneo Ediciones, Valdivia, Chile. Gardner, M. 2013. Podocarpus salignus. The IUCN Red List of Threatened Species. Version 2015.2. <www.iucnredlist.org>. Gastman, E. (1988). Propagación vegetativa de coniferas chilenas con aptitudes ornamentales. Facultad de Ciencias Agarias, Universidad Austral de Chile. Hechenleitner, P., Gardner, M. F., Thomas, P., Echeverría, C., Escobar, B., Brownless, P. & Martínez, C. (2005). Plantas amenazadas del Centro-Sur de Chile. Distribución, Conservación y Propagación. Universidad Austral de Chile y Real Jardín Botánico de Edimburgo, Santiago. Rodríguez, R. R., Matthei, O. & Quezada, M. (1983). Flora Arbórea de Chile. Universidad de Concepción, Concepción (Chile). Stoll, A. & Hahn, S. (2007). Nuevos registros extienden el limite Septentrional de once especies Valdivianas al norte del Rio Maule, Chile. [New records extend the distribution of eleven Valdivian species to the north of the Maule River, Chile. Gayana. 64(1): 110-116. M.F.Gardner, 2016. Podocarpus salignus, from the website, Threatened Conifers of The World (http://threatenedconifers.rbge.org.uk/taxa/details/762).